Allan Starrett – N. S. W.
Coaching tips and information for Clubs and Players – A must read from Allan Starrett (NSW). Click on the link below. 2017 Version – “KEEP ON PLAYING” – A Guide to the Skillful Use of BOWLERS ARMS. This still has the main essentials with some additions for helping clubs overcome problems associated with damage to greens by “Bumpers, Dumpers and Thumpers”. To be included in forthcoming editions will be important advice on playing on significantly heavy greens, on-shots and drives. This will include insuring that the left hand is held more firmly against the thigh preventing any rotation of the shoulders above the waist and subsequent loss of intended direction. Those using the “Hacksaw” type arm should only use your finger tips on the trigger bar. Wrapping your fingers tightly will cause a delay in delivery release and the bowl will elevate. This paper has been written and produced by Bowls Victoria – as an aide to Victorian bowlers using an Arm Device. A wonderful “how too”, must read document for all Armed Bowlers. Armed and Dangerous – Brian Ing (Vic.) from Bowls in Focus. Brian was probably the first “arm exponent” and traveled all over Vic. teaching Coach’s how to Coach the “ARM” My hero, wish I’d met him. If anyone would like to share stories of or about Brian, I’d love to see them here. Sadly Brian passed away in April 2015. His legacy lives on. Read more. Col Griffin (AKA Mango Chutney and Artwombat) – Queensland. Click here to read Mango’s slant on coaching bowlers to use a bowling arm…..well worth the visit, and artistic to boot! 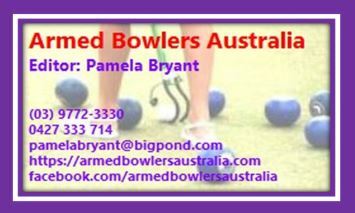 Coaching Video for Armed Bowlers from Bowls Aust’s Coaching Den – by Neil Crisp & Steve Glasson. Neville Rodda – New Zealand. How to aim with the opposite foot. What is the role of the Leader. How to hold the bowl. Ensure bowl is housed so that it will travel on the centre running surface. From the mat, visualize aiming line, jack high. Find a point of focus 8-10 out. Check your feet, place weight on the balls of your feet, 80% on the stationary, 20% on the stepping out foot, knees relaxed. Do a practice swing or two, to feel the weight of the bowl, with arm & wrist firm but not tight. Hold the bowl with the minimum of stress. Taking a SHORT step, release the bowl at 6 o’clock, on the exhale, beside your stepping out foot. Heal on step no further than a few inches in front of mat. Make sure you remain upright, no slouched shoulder, looking at your point of focus. Stationary foot to remain on mat, roll up to toe. For more information on Coaching players with a Bowling Arm please click the link below to go to the Bowls SA Coaching Committee booklet. This booklet will provide coaches with the knowledge needed to coach players with a Bowling Arm, from their stance to using the correct Bowling Arm. Click here to see the Coaching Players With Bowling Arms Booklet. New arm bowlers and digging into the green with the arm is an issue but by stepping forward with your “wrong foot” is a solution. “Wrong foot forward” has the arm and your leg travelling side by side making it harder to accidentally lean over and dig the arm into the green. Rob Parella represented Australia in Bocce and Lawn Bowls. I have seen Rob Parella draw bowl left foot forward then drive right foot forward so the Italian wrong foot forward does work in Australia I have also played Bocce “Rules” the international game and bowling “wrong foot forward” is their convention. The “shooters stance” is the same as the South African 1/2 step and it is a shame he foot faults in the video. C) then a delivery stroke stepping forward with the “wrong foot.” and transferring my weight onto my “wrong foot.” for a follow through effect. Getting within range for extreme weights. I can preset the range by my stance – by how far my “wrong foot” is behind my other foot. Hence a bigger step for heavy greens and long ends and vice versa. I am an experienced bowler and taken up the bionic arm because of progressive T2 diabetes nerve damage to fingers and feet. I have won Cunningham Districts 4s, 1st div pennant, and Champion of Champs 4s been and I have playing for 30 years. I have had my bionic arm for 4 months done a lot of practice and tried all sorts of techniques and played 4 games with modest success. I hope this info helps someone battling with an arm. Shooter’s Stance is also a good for diabetics and those with peripheral neuropathies. We should be thinking what is best for arm bowling and forget hand bowling. The problems I see with arm bowling starts with trying to emulate hand bowling instead of working out what needs to be done from scratch. 1) The first thing you need is a REGISTER/TRIGGER POINT so you know when to release the bowl. 2) The second thing you need is a height above the ground control so it always releases at the same height above the ground. 4) The fourth thing you need is a weight correction technique. During delivery 1,2,3 above should be a given, the concentration for actual delivery should be all about the weight. Everything else should be pre decided and taken care of by technique. BYE BYE hand bowling none of it is a must do anymore. Advice from hand bowlers is about as relevant as hand ball is to tennis. I prefer to write up newly learned stuff. “Old hand” stuff is good but some newly learned stuff seems better sometimes. Anyway as I progress with my arm I might write some more. I do art and I have done some videos and slide show videos, so I might attempt one of those on this subject. Thanks for the Shooters stance tip.